V8 SUPERCAR driver and Erebus Motorsport pilot Will Davison recorded one of the most satisfying wins of his career with a calculated and patient drive in a memorable final race of the Perth SuperSprint today. Capitalising on a perfectly orchestrated team strategy where he finished strongly on soft tyres, Davison called on all of his years of experience to calmly chase down race leader Craig Lowndes with four laps to go and storm his way to an emotional victory. The win marked Davison’s first victory for Erebus Motorsport since he joined the rising team at the start of 2014, while it was the team’s second race win since the operation commenced in 2013. The landmark podium was delivered on what was one of Erebus Motorsport’s most successful days across multiple categories in V8 Supercars, Dunlop Series and V8 Utes. 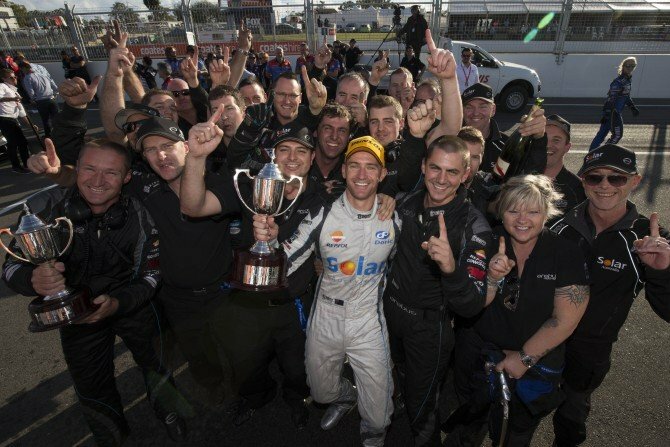 Erebus Development driver, Academy graduate and current V8 Supercars co-driver Jack Le Brocq recorded his best Dunlop Series result after finishing second overall for the weekend, while Erebus Academy driver Adam Marjoram also finished with his best result with a second placing for the weekend. Davison said the result was a particularly special victory given he has been a part of the building process at Erebus Motorsport over the past 18 months. “This is very, very special. It’s been a big move to come to Erebus so this is damned special,’’ said Davison. “It’s very sweet because we are working really hard trying to get this package up to speed. “It was a big outpouring of emotion when I crossed the line, I just couldn’t believe it. I knew how much it would mean to the team and I was picturing them in the garage in the closing two laps. “This is a big deal for us, I won’t lie. This level of sport, trying to get sponsorship and trying to really build a team is a big thing. It’s a great responsibility I’ve had and money can’t buy this sort of stuff for the crew and our motivation and the hunger to achieve it more. “This is going to give our whole team and our whole operation a real pep up. It feels really special to get that for Betty. The win was special too for Davison’s engineer Luke Mason, who grew up in Western Australia. It marked his first V8 Supercars victory as a race engineer. “Luke is a young guy and a local boy, a proud Perth boy. He stayed really calm on the radio and it was good, I could even hear in his voice that it was a big moment for him,’’ said Davison. “With three to go, I said “is this all good, you’re pretty quiet in there, is there something I should know about?” It was all really calm. “It was one of those perfect races, it was real enduro with long stints, big strategy and a massive team effort. You needed all your ducks to line up.